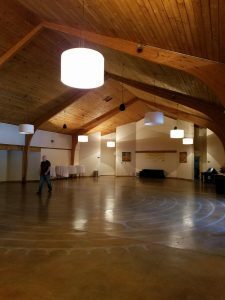 SouthWest Writers holds their meetings in the Labyrinth Conference Room at the Albuquerque Center for Spiritual Living (ACSL) on Louisiana two blocks north of Menaul at 2801 Louisiana Blvd NE, Albuquerque, NM 87110. The center is located on the west side of Louisiana between Claremont and Candelaria. 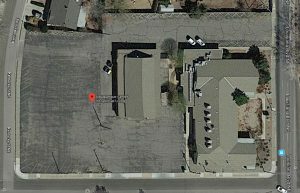 A large parking area surrounds two buildings. 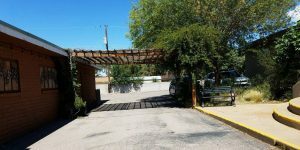 The main entrances to both buildings lies between them through an arbor. Handicapped parking is on the south side. 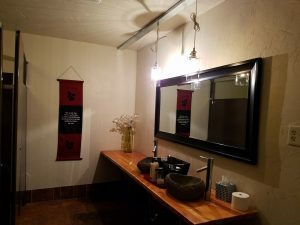 The centrally located Labyrinth Conference Room offers a spacious meeting area, a kitchenette, and generously sized restrooms. This large room is used for the first Saturday meetings and most of the mid-month meetings held on the third Tuesday of every month. A smaller, more intimate, space is available should we need one. The exterior of the facility is very low key, though there is a sign on Louisiana. 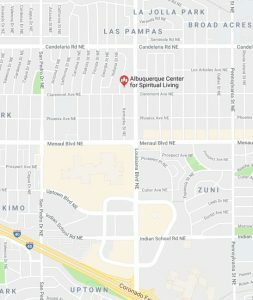 A map showing the cross streets is at the bottom of this page.